I am a writer researching a book and I am trying to find out more about the role of my English mother, Joyce Kathleen Johnston, in post-war Germany. All I have to go on at the moment are a few photographs and some memories of her talking about those years (she died several years ago). 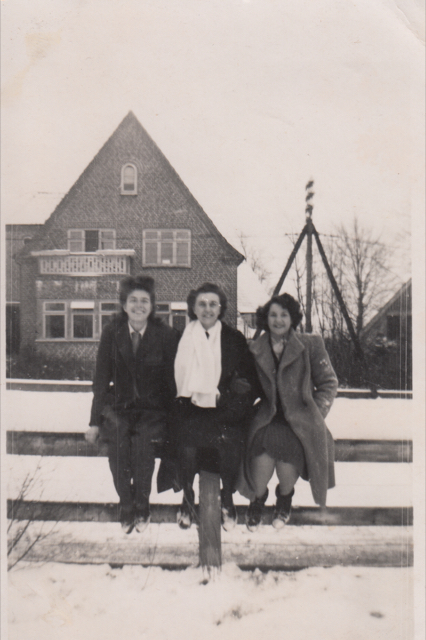 The pictures show her and some girlfriends in and around Kiel at some point between 1945 and 1946/7. 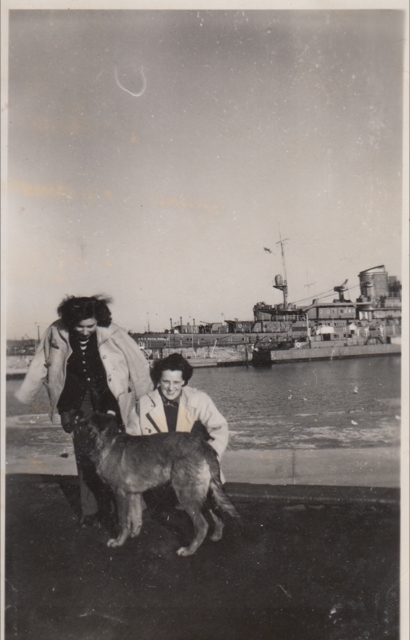 In one picture, they are posing in front of HMS Royal Harold, which I understand was based in Kiel at about that time. In addition to some tourist shots showing sunken ships, the Rathaus and the Holster Gate, other pictures show them sailing, riding horses (and impeccably dressed while doing so) and playing with two German shepherd puppies. They appear to have German staff and to be occupying a largish German house. One of the puppies, Brutus, would come home to England with my mother; there are photographs of me as a toddler riding on his back. 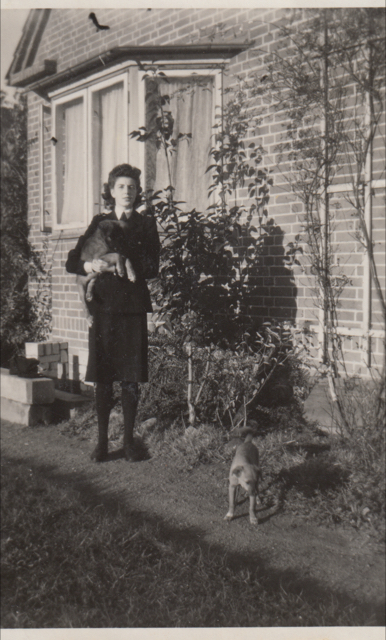 In a couple of photographs, my mother appears to be wearing some kind of civilian uniform, black jacket and skirt, dark stockings, white shirt and black tie. The jacket seems to have epaulettes, each perhaps bearing two pips. Does anyone have any idea what she might have been doing there? My working theory is that she was part of the Control Commission for Germany. Would their junior personnel have worn uniforms? My mother was 18 or 19 at the outbreak of the war (during which she drove ambulances in London) so in 1945 would have been 24 or 25. Grateful if anyone can help with info - happy to share pix. I have offered to help where I can! Identifying locations beyond the obvious will be difficult. Unfortunately the photo is not clear enough to identify which Arm or organisation the uniform belongs to. 2. 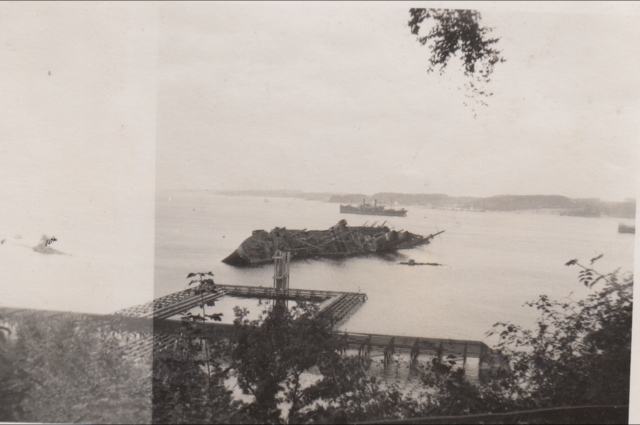 The photo shows same swimming baths and the ship SS New York on its side. Note. The beach baskets on the LH side of the baths in the photo. 3. 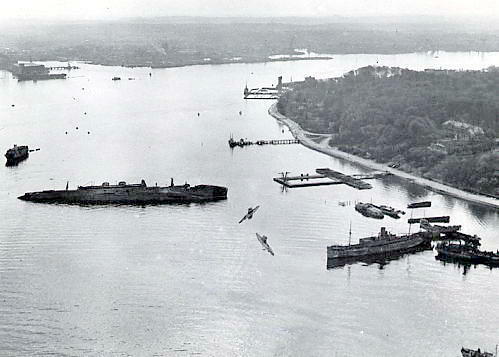 The aerial war photo shows the 'SS New York' still on its side and not far from the swimming baths. I suspect the diving/watch tower had been removed from the baths, as I can't see the tower in the aerial shot which was taken Dec 1945. Note: Major Hibbert was a few years ago awarded the 'Freedom of Kiel' for his heroic part in preventing the Russians making an advance from the Baltic to the North Sea. Welcome and thank you, for me, a very interesting query. Like Alan, I am a member of a small team currently researching and recording the British presence in Schleswig Holstein in the immediate post war period. My interest stems in part from the fact that I am a proud Old Boy of King Alfred School Ploen, the Forces Boarding School set up in the late 1940's ,on the site of the Establishment created by the German Admiralty in the late 1930's to provide trained Sailors for the Kriegsmarine Fleet based in Kiel (twenty miles away).It was also briefly the principal Royal Navy Headquarters for the entire province of Schleswig Holstein and was known as HMS Royal Alfred. I offer the following comments. 1. My immediate reaction on seeing the photo of your mother in uniform , linked to the unpublished photograph of her and her friends outside HMS Royal Harold which was the main British Naval Headquarters in Kiel in the immediate post war period, was that she was a member of the WRNS. I believe that in 1941/1942, following an Act of Parliament, a form of female conscription was introduced and all unmarried women and those with no children under the age of 30, could be directed to essential war work or those jobs linked to maintaining vital civilian services such as health, education or food. Many chose to join the female equivalent of the three Fighting Services, the WRNS, ATS or WRAF. Did your Mother? There were a number of Wrens in Kiel in the immediate post war period. Alternatively I have documentary and photographic evidence that Members of the CCG did wear a military style uniform for a time in the immediate post war period. This appears to be Army style battledress, collar and tie with the battle dress dyed a midnight blue, for obvious reasons black was rejected (with its link in German minds to the hated SS). The difference would not be easily picked out on a photograph of the 1940s era. If she was employed by the CCG then it was more than likely she based in what was known by the British as Somerset House in the then south east suburbs of the city. 2. The sequence of photos outside a private house. 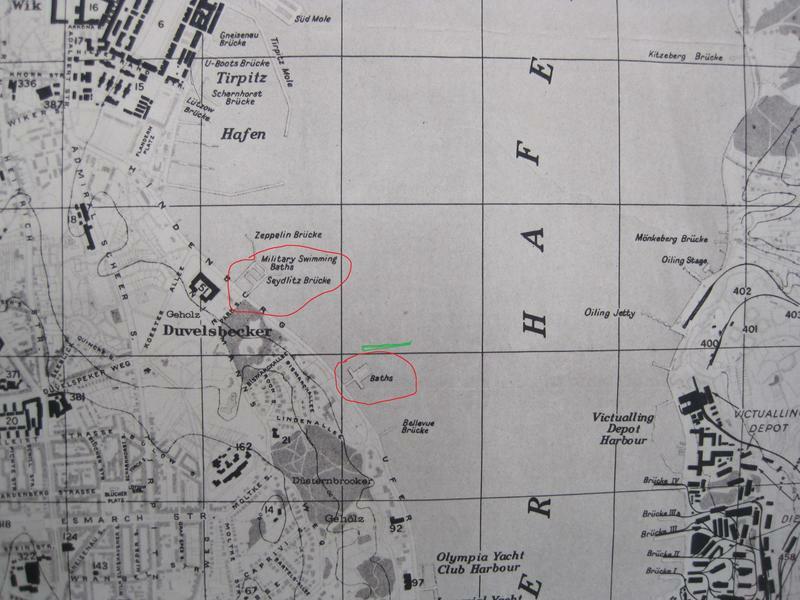 90% of central Kiel,including the dockyards and associated naval barracks, was either or rendered virtually uninhabitable by bombing by the end of the war. Many British naval personnel were accommodated for a time on board the relatively undamaged SS(renamed HMS by the Royal Navy) Milwaukee, the sister ship to the SS New York shown in two of the photographs. However I suspect that this was judged to be unsuitable for the WRNS and they and others (including female members of the CCG) lived in requisitioned civilian houses close to where they worked. If the previous occupants were lucky one of them might be re-employed as caretaker/housekeeper/cook but would have to find their own accommodation. Your mother could have been one of a group of three/four young women in this type of accommodation. 3. 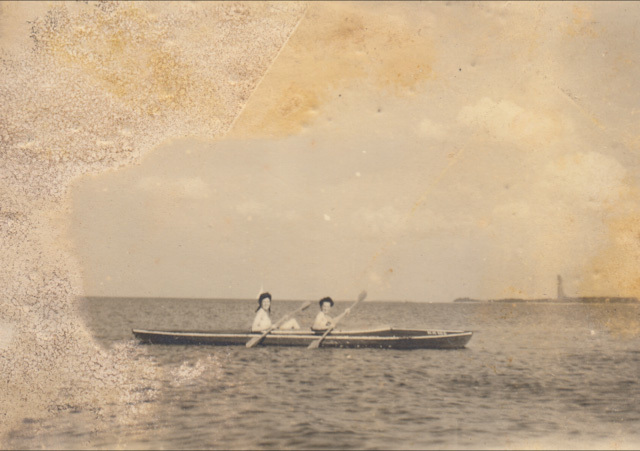 Sailing and similar water borne activities was an extremely popular off duty pastime with all ranks based in the coastal areas of Schleswig Holstein. On arrival in Kiel the British had seized the building which had been the Headquarters of the German 1936 Summer Olympics Regatta and a number of sailing vessels. This was to become the nucleus of the British Kiel Yacht Club which finally closed earlier this year as result of the draw down in British Forces in Germany. The sailing sequences were undoubtedly taken on board one of these yachts. I think the photo of your mother and friend in the canoe is taken a little further down coast looking across Kiel Bay in the direction of Laboe (the tower on the skyline could be the memorial to German WW1 U Boat crews lost at sea which is in the form of a U Boat conning tower- after considerable debate, the RN authorities decided not to demolish it in 1945. 4. Similarly riding and other equestrian activities was an extremely popular off duty past time. There was no shortage of suitable mounts, not withstanding the reputation of the German Army Panzer (Armoured) Formations a very significant proportion of their logistic resupply systems were based on horse drawn vehicles. Also not far from Kiel is one of the premier centres of the war German bloodstock (the equivalent of Newmarket). 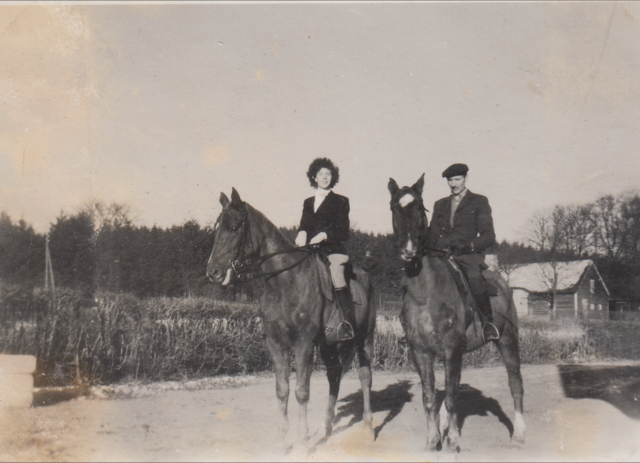 Your mother, accompanied by a German groom, looks completely at ease on horseback, is she wearing a hunting stock? 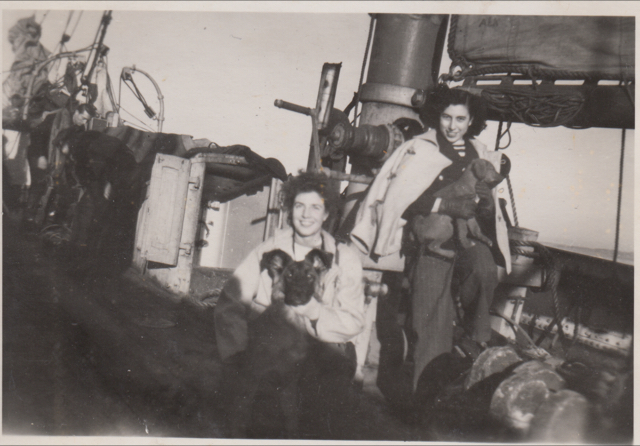 Incidentally there is a very amusing anecdote on another similar site which recounts that a young WRNS Officer when posted from HMS Royal Alfred in Ploen to HMS Royal Harold in Kiel in 1945/46 succeeded in having her favourite hunter follow her. Hope these thought are of use, please do not hesitate to contact me (via a pm if neccesary) if you think I can provide further information for your project.